As October is approaching its end, so is the traditionally considered summer season for 2017. Here in FindinGreece, we are very pleased to share our impressions from this wonderful first season of ours and invite you to follow us on our continuing journey through space and time. 2017 has admittedly been a year of touristic boom for Greece in general. With visitor arrivals reaching record levels, it has been a challenge to ensure the authenticity Greece offers remains intact. Well, it seems it does. 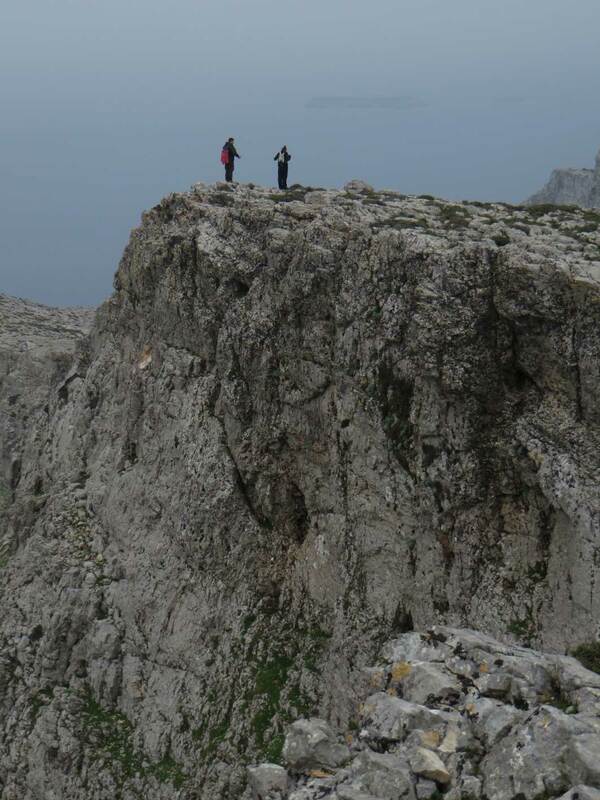 The natural beauty and dramatic landscape still make for fantastic hikes and other outdoor adventures. 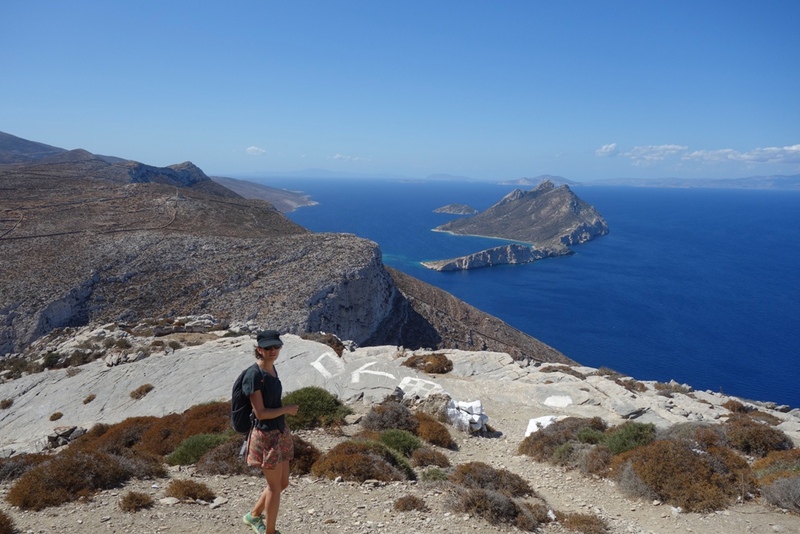 On the island of Amorgos, we’ve had the opportunity to guide visitors through centuries-old paths, allowing them to admire the pristine nature, surrounded by pure tranquility and an ever-shining sun. 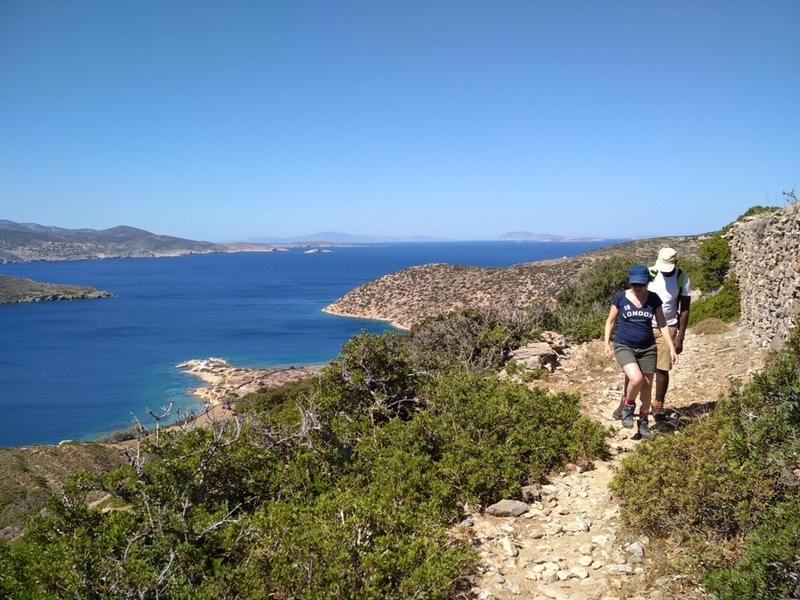 During the hotter summer months, our sea-related activities have been more popular, with travellers opting for snorkelling, diving, kayaking or paddling, enjoying crystal clear waters and a stark rocky background. Back in the villages, it has been a pleasure sharing authentic instances of local life. Donkey rides, fishing trips, Greek dance classes, ceramic and mosaic classes, visits to the organic gardens and introduction to the richness of local herbs, cooking and pastry classes, even Greek language lessons, have all been enjoyed by many visitors and we are extremely happy to have played a role in their shaping unforgettable memories. After all, travelling is about experiencing and there is no better reward for us than seeing our visitors’ smiling faces when catching their own fish, tasting their own made local dish or wandering through the serene countryside on the back of the donkey. From the bottom of our hearts, we’d like to thank all of you for making our dream come true this past summer. FindinGreece, Semeli and Alix, will continue offering unique experiences all year round and we hope to have the chance to share them with you soon. All the best from the Greek islands! 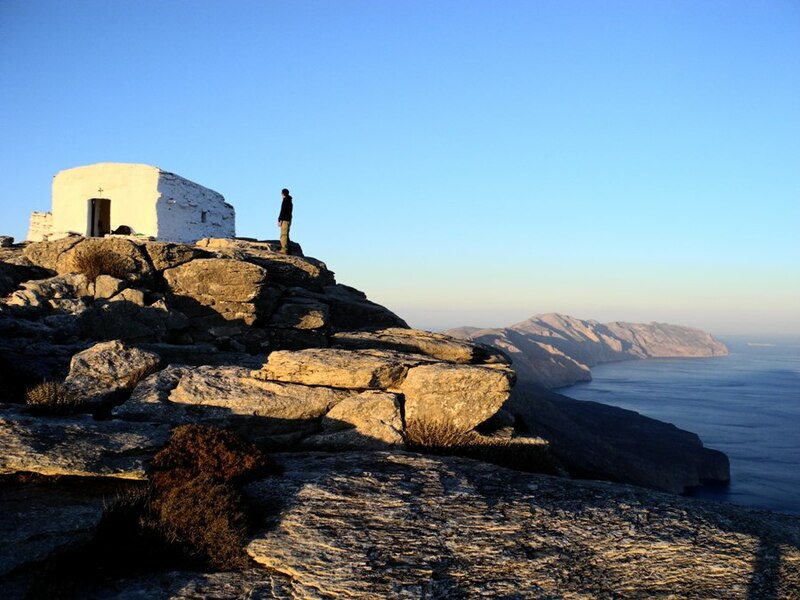 It is 6:30 am, Sunday morning on Amorgos Island. Early spring, still chilly at dawn, but you can already feel the summer approaching. Clear sky, calm sea. Nobody is seen around at the quiet port of Aegiali where we meet to drive across the island to the small dock of Xylokeratidi in Katapola. Half hour later we are there, exchanging wishes for a beautiful day with fishermen that are just beginning work under a glorious sun rising behind the mountains. 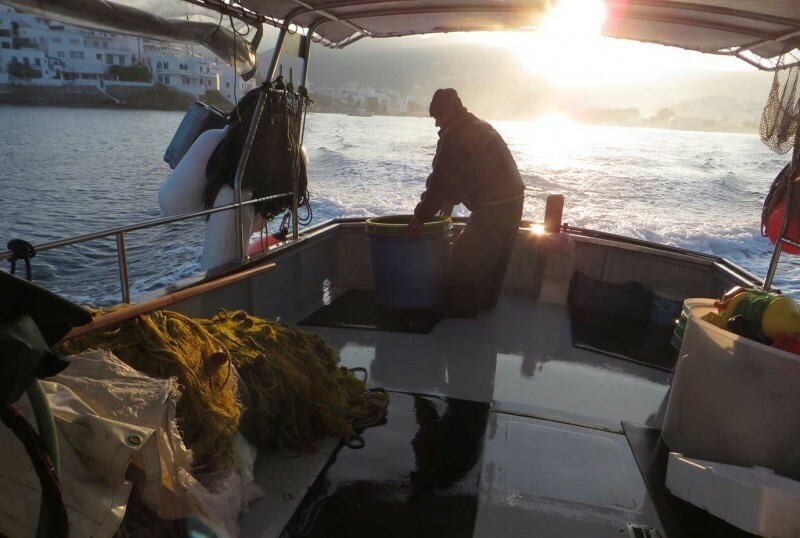 Giannis, our fisherman, quickly docks his boat “Kapetan Nikitas” and welcomes us on board. We are about to set off on our first fishing trip together and we are very excited. Giannis and Loukas, his crew, have spent the last few hours throwing paragadia at sea. Paragadi (longline fishing) is a special kind of fishing, involving a good deal of tedious work in exchange for first quality and significantly sized catch –when it happens. 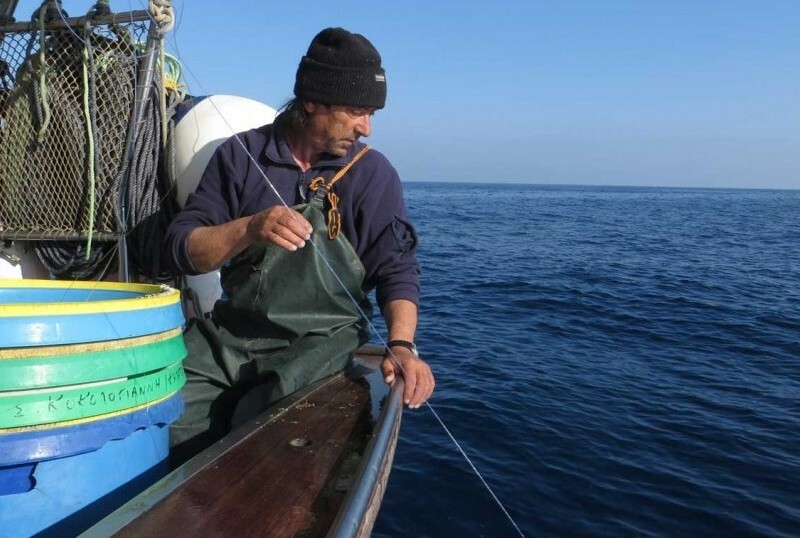 Giannis and Loukas have painstakingly baited dozens of hooks during the past evening, before throwing five paragadia (main line threads of them) at sea just before dawn. They must be exhausted but we wouldn’t be able to tell from their smiling faces and excitement to explain all their work and equipment to us. The sun is slowly rising and warming us up, the sea is comfortingly blue and calm and it feels like it’s going to be a great day. We head west, exiting the bay of Katapola. Soon after, we stop to pick up the first paragadi to the boat. Giannis and Loukas coordinate their moves perfectly, collecting the thread and rearranging the hooks. The bait has gone from most of them, probably by currents, but so far no fish seems to have approached. The two men work silently as the thread reaches its end, with only a few comber fish caught on its hooks. Continuing with the rest of line threads, things start looking more promising. First a 2 kilo and then a 5 kilo seabream appear shining from the depths of the sea bringing wide smiles on our fishermen’s faces. A little bit later, a happy cry from Giannis brings all looks down the bottom. We can hardly see any sign of movement or even different colour down there yet but Giannis and Loukas are sure: it is a fish and it is big. 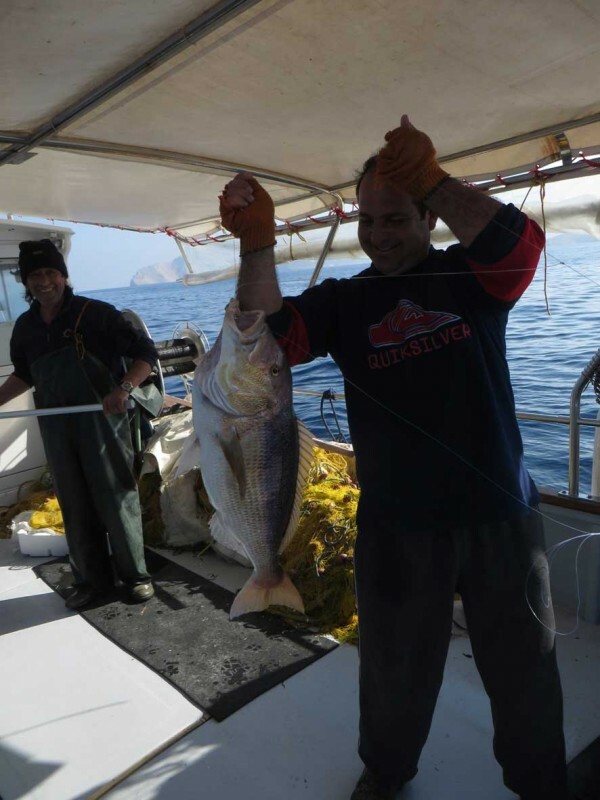 A few moments of excited expectation culminate with the appearance of the fish: an 8 kilo dentex, elaborately caught in the net of Loukas once its hook reaches surface. Our fishermen are obviously proud and happy, posing for pictures with their catch. But it isn’t over yet. We are excited and greedy. We want to see more. As hours go by and we appreciate even more the load of work and effort put by our fishermen, we feel like the trip is still not giving the return due. And our thoughts come true. Another two 4-kilo seabreams reach the surface and more proud pictures and smiles follow before Loukas collects the last thread around its buoy. Relaxed and satisfied, our captain deviates towards the remote beach of Vlychada, well hidden in a closed bay at the north of Katapola. We are amazed at how there are still places we just begin to discover on this seemingly small island. 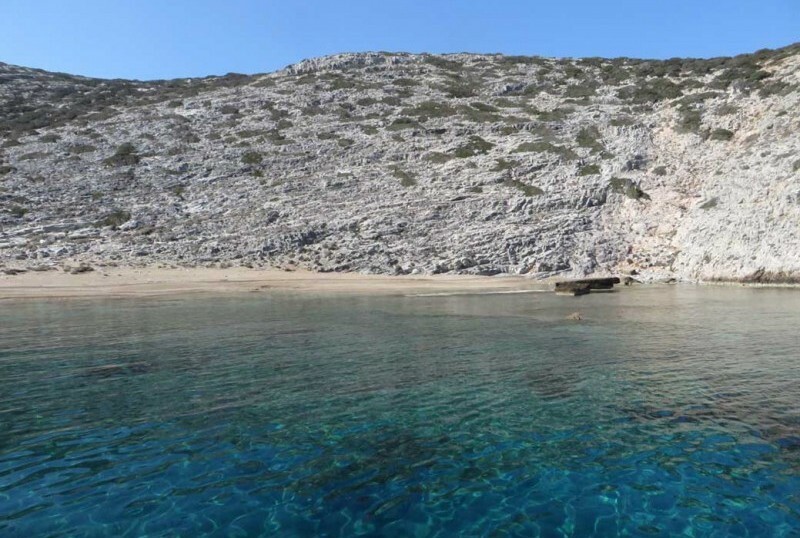 There is no road or path reaching the beach of Vlychada and only few boats make it here when weather permits –very rarely in summer. It seems it is our very lucky day today and as we approach the sandy beach, we can’t help but closing our eyes facing the sun, listening to the familiar sound of light waves gently lapping the shore. Turquoise blue shallow water sparkles below us and the warmth of the sun once more reminds us that summer is just around the corner. It is almost midday when we enter back at the bay of Katapola. Terraced slopes covered by grass and flowers surround us as the villages of Katapola appear ahead us. A long day for our fishermen is approaching its end –but still a lot of work is awaiting them after a much wanted coffee break at the port. Fellow fishermen and villagers await us at the dock, curious to find out what the catch has been today. Smiles and jokes follow at the sight of the big fish, which are quickly weighed and loaded on the van to find their way to the market. It is sunny, warm and peaceful. A lovely family atmosphere shared with locals on a beautiful Sunday morning, heralding more bright occasions during the following months.